Copenhagen, the capital and largest city of Denmark, is also the main hub of tourist attraction in the country. The city is full of fine buildings, as in the medieval Old Town (Middelalderbyen) where is the small island of Slotsholmen with the Christiansborg Palace and Christianshavn, or as the royal palace of Amalienborg, or the buildings in the suburb of Frederiksstaden, dating back to the eighteenth century, which represent one of the most important complexes in rococo style in Europe. Another of the city’s attractions are its beautiful parks. 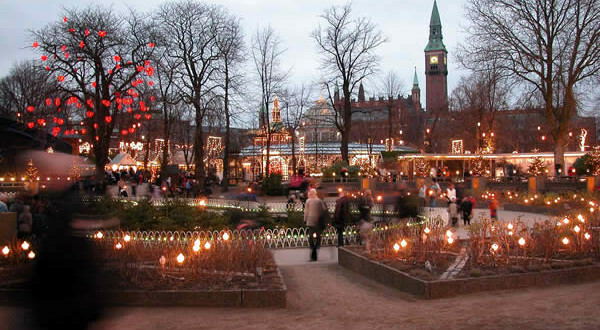 There are many Christmas events in the Danish capital, in addition to the many Christmas markets you will find displays of Christmas carols, concerts, ice skating rinks, rides and games for children. Tivoli Christmas Market (Jul i Tivoli). This market takes place inside the famous Tivoli Gardens amusement park in Copenhagen. There are miniature villages with shops full of gifts and Christmas items. The park is rich of Christmas lights in the beautiful scenery, the lake is transformed into an ice skating rink. Other highlights include the Christmas cabaret and fireworks. Opening: 17 November – 31 December 2018. Opening Hours: from Monday to Thursday and Sundays from 11am to 10pm; Friday and Saturday 11am to 11pm. Closed on 24 and 25 December. Organizers: Tivoli A/S, Vesterbrogade 3, 1630 København V, Denmark. Phone: +45 33151001. E-mail: info@tivoli.dk. Tivoli Erhvervsudlejning, T. 33 75 06 65. E-mail: bod@tivoli.dk. Nyhavn Christmas Market (Nyhavns julemarked). This market that is set in the charming old harbor of Copenhagen, the stalls offer handicrafts, local dishes and you can listen to traditional Danish Christmas music. The stalls are lined up along the pier, where are some of the oldest houses in Copenhagen, expertly decorated with garlands and Christmas lights. This is one of the most beautiful Christmas markets in Denmark. Opening: 9 November – 23 December 2018. Opening Hours: from Sunday to Thursday from 10.00 to 19.00; Friday and Saturday from 10.00 to 20.00. Nytorv Christmas Market (Julemarked Kongens Nytorv). A great Christmas market and big event will be open to everyone throughout the Christmas period. One of the best Christmas events in central Copenhagen. Opening: 16 November – 21 December 2018. Opening Hours: Monday to Wednesday: 11.00 am – 7.00 pm. Thursday 11.00 am – 20.00 pm. Friday: 11.00 am – 9.00 pm. Saturday: 10.00 am – 9.00 pm. Sunday: 11.00 am – 6.00 pm.